Practice: Family Choir – Saturday at 5 PM. One wonderful reunion tradition is singing in the family choir. Every reunion has been graced with singing, and our family has an abundance of beautiful voices. Traditionally, the choir sings at the talent show and at the Sunday church service. Please join in singing songs of praise. Found in the Benrud family newsletter. 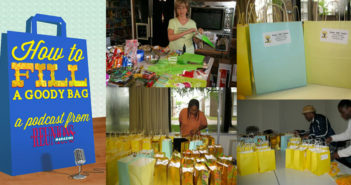 Click image for full-size version. For families who have an affinity for music, along with talent, reunions are ideal places to share their interests. The Benrud Family Reunion must be melodious, indeed. The Benrud Choir, high school age and up, sings for the talent show and church service. A younger group, The Benrud Family Singers, is for children grades three through eight; they also sing both days. Finally, The Benrud Band serenades the family picnic and is for players of all ages and all instruments. Musicians can request music in advance on the registration form, where they also list their instruments and skill levels. Whether members in these groups or not, everyone is encouraged to perform in the talent show. A five-minute time limit is enforced, because with so much talent a reunion of 400 members could have an endless show. Reported by Julie Backus, Port Washington WI. Welcome to Our Family Reunion! the late Aaron and Jossie Malone. They left a spiritual legacy to their 14 children, 80+ grandchildren, 65 great-grandchildren, 10 great-great-grandchildren and generations to come. The spiritual legacy of the Malone Family Choir began long before the choir was formed (around 1983). Malone children were exposed to singing and the power of prayer, praise and worship from their parents, in the cotton fields and in Pleasant Grove Missionary Baptist Church in Crawford, Mississippi. The Malones were pillars of the community, well respected and loved by all who knew them. Aaron, known as a Big Daddy (to his family), was a member of the Deacon Board and an adult Sunday school teacher. Jossie, known as “Mama Jossie,” was on the mothers board, sang in the choir and was known as a “great intercessor” and a “true evangelist.” Whenever there was a revival, she went door to door and town to town looking for lost souls to win to Christ. All fourteen children attended church every Sunday and were in the choir. As the children reached adulthood, the boys were first to leave home. Appling and Aaron, two of five brothers who moved to Flint, Michigan, started a singing group, the “Gospel Southern Aires.” The girls remained in Mississippi for a while and formed the “Malone Sisters” singing group. At every gathering, the family enjoyed fellowship and singing. The first official family reunion in 1973 was for Aaron and Jossie’s 50th wedding anniversary celebration. 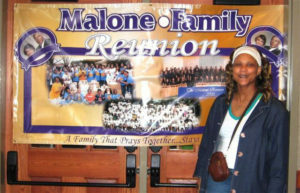 The Malone Family Choir was formed ten years later, under the direction of the youngest daughter, Jossie. 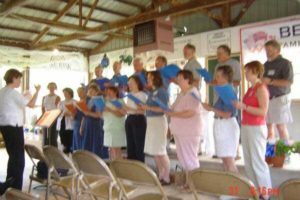 The Malones are committed to carrying on the tradition of gathering each year for a weekend to honor their parents and deceased loved ones in a Sunday evening concert. This notice was sent to encourage participation. Kids, think the old hymns need a shot of energy? Here’s your chance to put the joy in “joyful noise.” Send me words (music too?) of your favorite peppy choruses and church camp songs and I’ll print them in the Wilson/Leverich songbook. Then join in singing. Serious music lovers, this family prints sing-a-long songbooks with songs they remember hearing their parents and grandparents sing and play. The list for a recent reunion included My Own Little Sweethearts, Sarah Jane, the Cat Came Back, Treat My Daughter Kindly, Two Little Girls in Blue, Springtime in the Rockies, ‘Twas a Nice October Morning, Pop Goes the Weasel, Little Brown Jug, Whispering Hope and Church in the Wildwood. Compositions from some serious family musicians also were included. For the very young, including pre-schoolers, a children’s bell choir was formed to entertain. Cassandra Hamilton, Hampton, Virginia, reports that the Feaster/Lyles Family Reunion holds a Prayer Breakfast on Sunday morning, where a local minister delivers a message and their own family choirs provide the music. The mature Feaster-Lyles Family Choir and The New Generation Choir provide inspirational, religious songs. Hamilton says, “We have quite a few truly musically talented family members. We discovered a great music starter idea in the Restoration Hardware catalog (www.restorationhardware.com). The product is called Family Band. It looks like a fun item for families who are into making music, whether rehearsed or improv. Your family might be enchanted with this collection, which includes bongos, ruthromel and stick, box shaker, snocker, tambourine and maracas. Make a joyful noise. 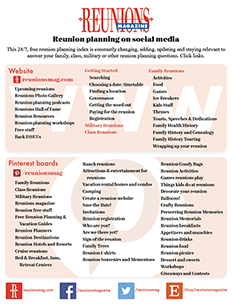 Martha Jo Dendinger, CMP, in an article in Meetings & Conventions Magazine (1998) lists some issues for hiring reunion music. To hire live talent, gather recommendations. 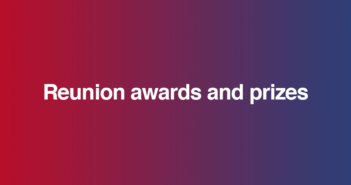 Ask for suggestions from other reunion planners, the CVB, a university’s school of music, and contacts at the venue where the event will be held. Bands who play regularly at facilities know the layout and its special requirements or restrictions. When you’ve made a list, see and hear the group or deejay in person at a similar event or view a videotape of an actual performance. Ask performers for references. Ask references whether talent arrived on time and performed according to the contract. Discuss payment terms, cancellation policies, and uncover any special requirements or fees. Put basics in writing: date, time, place, style of music and budget. Ask for a proposal that lists the personnel number, music style, fees, setup, rehearsal requirements and any special needs. Outline your song list in detail. Contract performers should arrive an hour prior to show time. Provide a special area for changing, breaks, etc.